Elbow pain is commonly known as golfer’s elbow or tennis elbow. It can be a result of overuse in one of these sports, but there are many other causes for this condition, including tension, repeated use of the arm for work or recreation, arthritis, a bone disease, a sports injury or another chronic condition. The pain in your upper arm is most likely the result of soft tissue damage in the muscles and tendons. You can begin with home remedies to try to alleviate your elbow pain, but if they are unsuccessful, there are many medical treatment options to try as well. A poor grip of objects. Pain increases with activities such as shaking hands. 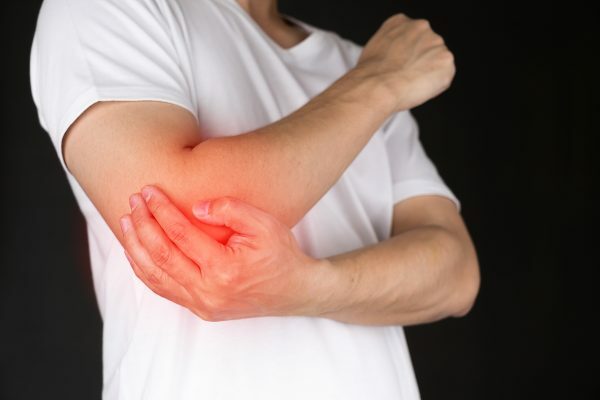 When you first experience the pain in your arm, it is likely that if you act immediately that you can alleviate your pain yourself, unless the injury was a result of a fall or blow. Under those two circumstances, you need to seek medical help to determine whether you have a fracture or break in one of your bones. Home treatment should begin as soon as possible. Here are some tried and true tips for home treatment. Rest: First and foremost, you need to stop the activity that caused the pain and rest from exertion for several days. Ice: Ice the area with cold packs. Try 10 minutes on and ten minutes off. The ice will reduce the likelihood of swelling and stimulate blood flow in the area. Compress: You can wrap your elbow with a compression bandage to support the area. Elevate: Keep the area elevated to reduce swelling. Pain and Ani-Inflammatory Medication: It is helpful to take over the counter pain and anti-inflammatory medication. While it is vital to stop the activity that is causing the pain, it is also essential to exercise the muscles to increase blood flow and flexibility. Pain often prohibits people from becoming active again after an injury. Your pain medication will provide you with time to move your arm more and more each day. Medicated Rubs: Some people benefit significantly from medicated rubs. These do increase the blood flow in the area. Massage: Massaging the muscles in your lower arm will increase the blood flow. With increased blood flow, the build-up of lactic acid in the area will be reduced. Often the lactic acid is a cause of your pain. However, if the pain conditions are not remedied within four to six weeks, it is time to seek medical help. There are many conservative treatments available to you once you seek a pain doctor in New York or pain doctor in New Jersey at a pain treatment clinic. Your expert doctor will make every effort to accommodate your lifestyle and activity level with the least intrusive methods first. During the diagnosis of your issue, your doctor will complete a full medical background, including listing the drugs you are currently taking. Then he or she will examine your arm and see how much flexibility you have. Your physician may order some imaging tests to rule out any fractures. Once an accurate diagnosis has been made, then a course of action can be determined. The treatments will begin with the least intrusive methods possible. Often your well-informed pain doctor will combine several different approaches to alleviate your pain. At the pain treatment clinic, your pain doctor will work with the therapists to describe your issue so that specific care will be achieved. Some treatment options follow. Physical Therapy: Stronger forearm muscles will alleviate your condition. Your physical therapist will have you perform some exercises and then train you to complete these exercises at home. Gradually the program will be increased to build your strength. The therapist will also evaluate what may be the initial cause of the problem. Perhaps there is a repetitive action that can be modified for a work situation, or maybe your grip on the tennis racket or the golf club can be altered to induce less strain. Your therapist may also use ultrasound to enhance the healing process of the soft tissues. Prescription Medications: Your pain doctor may also prescribe prescription pain medication and anti-inflammatories to aid in your recovery. Acupuncture: This ancient practice is now recognized as being very effective for pain. Very thin needles are inserted into defined areas of your body to block your pain. Once your pain is controlled, you can complete the exercises that your physical therapist recommends. Injections: Your pain doctor can provide you with anti-inflammatory or anti-pain injections to soothe your pain and to reduce inflammation. The injections will more precisely target the injured area than any oral medications can. Surgery: Some surgical treatments are possible, but these will be suggested only after less intrusive methods have failed. There are two common types of surgery. Arthroscopic Surgery: A small camera is inserted near the elbow joint to locate the source of the problem. When the area is identified, then the orthopedic surgeon introduces surgical instruments to repair the damaged muscle or tendon. Open Elbow Surgery: The ruptured tendon is detached and removed. The tendon is repaired, or a re-approximation of the tendon takes place. You may need to wear a splint to reduce any movement. Stitches can be removed within 10 to 14 days after the surgery. It is likely you will need to work with a physical therapist to strengthen your muscles. Tennis elbow or golfer’s elbow can often be alleviated through home remedies. If the condition lasts for more than a month to 6 weeks, it is time to seek professional assistance from a pain doctor in NY or a pain doctor in NJ. At a pain treatment clinic, your medical assistance will start with non-intrusive care. These include physical therapy, prescription medication for pain and inflammation, acupuncture, injections, and even surgery. Surgery is suggested after many different other methods have failed to provide relief for your pain.